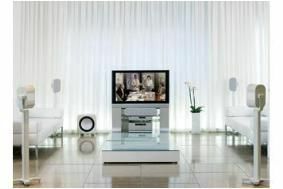 CES 2010: Monitor Audio unveils Apex compact sub/sat speakers | What Hi-Fi? Called Apex, the new models comprise the A10 compact satellite speaker; a larger wall-mounting speaker, the A40; and the 500W AW-12 subwoofer. All the satelites have an ultra-rigid die-cast aluminium construction and are finished in metallic black or pearlescent white gloss finishes with brushed metal alloy side trims. The AW-12 sub is made from 30mm MDF and finished to match the satellite speakers. A new C-CAM driver has been engineered exclusively for the Apex design, coupled with the RST dimpled cone geometry of Monitor Audio's GS and RX ranges. The 14cm RST cone is paired with a 25mm C-CAM gold-dome tweeter. The drivers are secured using a single central through-bolt fixing, which doubles as a cabinet brace to further reduce resonance. Also new from Monitor Audio is the SoundFrame, a slim on-wall speaker which is just 8.7cm deep. The speaker's frame can be finished in a choice of high-gloss piano lacquers or customised colours. Six optional grille colours are also available: ocean blue, beige, teal, light grey, burgundy and sand stone. The grille cloth can be printed with a bespoke design if required. There are two models. SoundFrame 1 adopts the aspect ratio of a typical portrait picture frame and is designed for use as a front left/right and surround speaker in music and film systems. SoundFrame 2 is much wider and is intended primarily for use horizontally as a centre channel speaker, although it can be used in the vertical position to flank larger displays. Both models emply a three-way, full-range driver configuration featuring a pivoting IDC 4in midrange/1in tweeter module and and 8in C-CAM bass driver.